When you tell your Facebook friends you’re touring a medical marijuana cultivation center, many ask if they give out free samples. Or giant bags of Doritos. But Desert Grown Farms, located in a white warehouse in an industrial stretch behind the Las Vegas Strip, is all business. It may as well be a hydroponic tomato farm run by big ag. 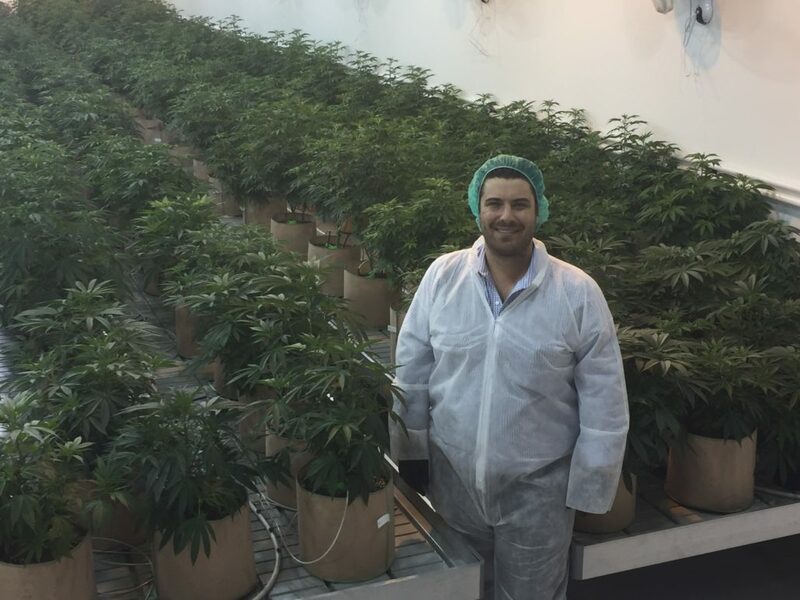 “The veg room is on 18 hours of light and six hours of dark,” says CEO Armen Yemenidjian, a passionate 6-foot-5 man with a booming voice. Short for “vegetative phase,” the veg room is the size of a basketball court and filled with perfectly formed marijuana plants where clones are cut from mother plants to root new ones. Yemenidjian – son of Tropicana owner Alex Yemenidjian and former VP of casino marketing for the hotel-casino – co-owns Desert Grown with newspaper publisher and real estate magnate Brian Greenspun and philanthropist Camille Ruvo. They’re the same trio who operates the Essence dispensaries in town. A tour of the Argus greenhouse control computer is next. This expensive machine automatically finesses the temperature, humidity and lighting in every room, and sends reverse-osmosis filtered water and a nutrient mixture through pipes streaming through the walls. Every once in a while, you realize you’re not touring a tomato farm. The security to get in, for example, is reminiscent of the headquarters of Cyberdyne Systems in “Terminator 2.” Almost everywhere, bolted doors can only be entered using keys encoded with your personal information. Also, disposable booties, scrubs or gowns, gloves, and hairnets must be donned at all times because nothing – not even the dead skin cells you shed – should contaminate the air or the product in an iota of a way. Other differences between this and just about every other business are less apparent. For instance, marijuana dispensaries can only conduct transactions in cash, adding another layer of complexity and security concern. Most large banks won’t deal with marijuana businesses due to fear of losing their FDIC insurance, or potentially being prosecuted as money-launderers. So they run payroll, cover expenses and pay taxes in cash. “The government doesn’t have a problem taking our taxes, though,” says Yemenidjian, who will refuse to show you where the cash is kept, even when you ask him nicely. In addition, dispensaries located within Las Vegas city limits are not permitted store signs that advertise to traffic and can’t sell branded clothing. And the amount of shelf space they can devote to paraphernalia is limited. Business insurance is also rendered uniquely problematic. Insurers will write policies for money lost in a robbery, for instance, or damage to the building in a flood or fire, but not for the value of any plants lost during their lifecycle. And there’s still just plain old inherent, uninsurable risk. Yemenidjian says he’s not personally worried that federal marshals might bust in at any time. Yet there’s no law guaranteeing that – only a 2011 directive from the U.S. Department of Justice, called the Cole memo, that instructs federal prosecutors to lay off dispensaries and cultivation centers as long as they adhere to a strict set of rules. And yet this doesn’t harsh anyone’s buzz. When licenses were handed out, applicants for dispensaries included retired Clark County District Court Judge James Bixler, former Las Vegas Assemblyman Chad Christensen and Oscar B. Goodman, the son of former Las Vegas Mayor Oscar Goodman and current Mayor Carolyn Goodman. Medical marijuana has been legal in Nevada since 2000. However, dispensaries haven’t been able to open – at least without being closed soon thereafter – until last August. Now, about a dozen have sprouted up across Las Vegas. They’re the first in the nation allowed to offer reciprocity. In other words, medical marijuana cards issued elsewhere in the country are honored throughout Nevada. Thus, these stores can avail themselves of the 40 million who visit Las Vegas annually, instead of just relying on the 2 million who reside here. In March, Essence opened the Strip’s first marijuana dispensary – between the SLS Las Vegas and Stratosphere resorts. Until now, it has had to buy its product from other growers. “This truly takes us to the next level,” says Yemenidjian. Desert Grown Farms’ first harvest is coming up before August. A few months later, when it’s fully operational, its 54,000 square feet will house 45,000 plants that should yield 12,000 pounds of marijuana per year, which will be sold from $2,000 to $3,500 per pound. Currently, the center employs only five people, but Yemenidjian expects to hire another 45 more in the next few months. When you ask Yemenidjian about his hiring requirements, you’re reminded again of the differences between this and every other business.